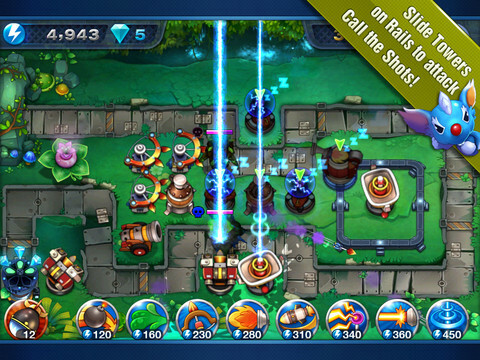 Gem Keeper from NCsoft adds a twist to Tower Defense games on the iPhone and iPad. After installing Gem Keeper, I immediately loaded the app and opened Adventure Mode, leading me to the Tutorial area. Don’t let the tutorial trick you: everything it teaches you seems like the typical tower defense game , but later on you’ll find out that Gem Keeper is more than that. In just the tutorial I noticed a few things: excellent graphics, easy to play, and features that make this application stand out from the rest of the tower defense games. Upon finishing the tutorial I went to the Forest area to finish a few stages, which all introduced me to new towers. The maps give you excellent opportunities to setup certain strategies. For an example, one of the maps had a couple of straight paths and a spiral leading to the object. Using my new Boomer tower, I set it up at the end of the straight paths to fire cannons in a straight line, taking out more than a few enemies at once. At the spiral I setup a couple of Slow’n’Steady towers to fire bombs at groups of enemies. This turned out to work pretty great. The reason why I mention this is because most tower defense games are simple: setup some random towers and wait. Gem Keeper changed it up a bit and allowed me to create different strategies to win. Concept: NCsoft, the developers of Gem Keeper, took the tower defense genre and added their own twist to it. Controls: Very easy to control. So far the only controls are tapping/clicking or sliding (for rail lines or setting up towers). The iPhone app version vibrates the device every time a crystal is permanently lost during the stage, but their is an option to turn that off in the settings menu. I’m not sure if the iPod Touch or iPad has this same feature. Audio: Overall, the music fits nicely. I honestly don’t know what kind of genre the music would fall under, but I hear some techno in it, making it a perfect audio track to listen to during a tower defense match. Graphics: Compared to other iOS apps, the graphics are pretty high up there. Beautiful environments and animations makes the game pleasant to look at. Value: At the time of this writing, the application sells for $2.99 in the App Store. Definitely a fair price for 30 different levels and the design of the app. NCsoft definitely put all of their effort into making Gem Keeper. Gem Keeper is worth the money, trust me. Designed for both the iPhone and iPad , Gem Keeper has the potential to provide hours of fun. Pick it up if you can! AppSafari review of Gem Keeper was written by Joe Seifi on October 25th, 2011 and categorized under Action, App Store, Featured, Games, iPad apps, Strategy, Tower Defense, Universal. Page viewed 5320 times, 3 so far today. Need help on using these apps? Please read the Help Page.